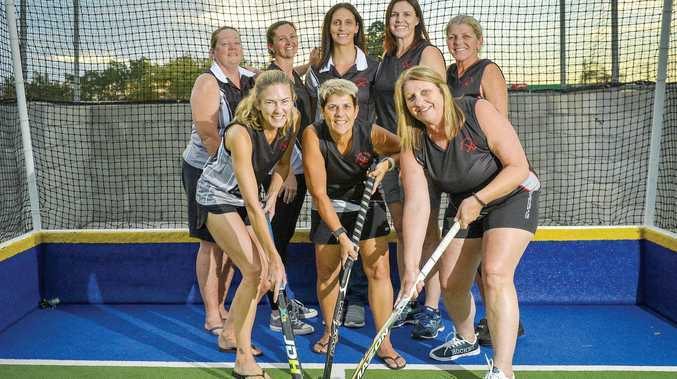 HOCKEY: Gladstone women's masters teams and players excelled themselves at the recent Hockey Queensland Women's Masters State Championships in Townsville. The Gladstone 1 women's team narrowly missed winning the division two final in a hard match against the much-fancied Townsville 1 team. Gladstone 2 women's team coach Judy Aitkenhead was impressed with the overall standard of the local players. "The number one team went extremely well and played a great structured game,” she said. The Gladstone 1 team was coached by Gary Porteous, who is currently in Barcelona, Spain, with coaching commitments of the 45s Australian men's team. The championships had 45teams playing in six divisions of quality hockey. Aitkenhead said to have this many quality players selected at this level was a testimony to the standard of Gladstone hockey. "The standard of the number one team and ability of the number two team to keep going despite them losing a player was a great effort,” she said. Women's Masters over-40 - Tarryn Job, Jolene Smith and shadow Lisa Grady and Carolyn Pease. Women's Masters over-45 - Caroline Jones. Women's Masters over-50 - Sue Rayner and shadow Debra Dawes. Women's Masters over-55 Number 1 - Terri Read. Women's Masters over-55 Number 2 - Deborah Creighton. Women's Masters over-60 - Shadow, Robyn Black. Women's Masters over-65 - Shadow, Robyn Black.